The epic Miracle On Ice, the run of the 1980 U.S. Olympic hockey team and how it impacted a nation. The NBA’s greatest individual rivalry, Larry Bird vs. Magic Johnson and their finest moments on the NBA’s biggest stage. The NFL decade starts with Joe Montana leading a historic drive that upended the balance of the power. The decade ends with Montana leading another historic drive that sealed the San Francisco 49ers Dynasty. Some of the greatest pennant races in the history of baseball, a one-game showdown that is a forgotten historical treasure and a series of memorable Octobers. NCAA basketball championship games that went down to the wire. You’ll learn further how the 1980s saw the NCAA Tournament transform into the cultural celebration that is March Madness. The greatest college football games of the decade, with a special look at the games that turned a small private college in Miami into a national brand known simply as “The U”. Martina Navratilova, Chris Evert and the showdowns that made fresh memories through the decade. On the men’s side, you’ll see the biggest matches of John McEnroe, Mats Wilander, Boris Becker and more. Historic moments in horse racing, greatness in pro hockey and thrilling moments in golf. 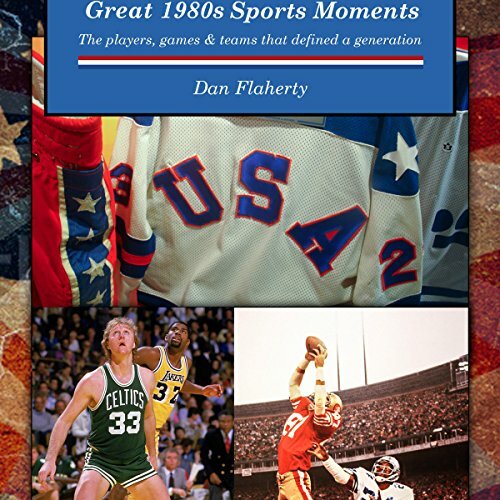 Great 1980s Sports Moments is a sweeping look at an entire decade, both comprehensive and concise, that is a must-have for the library of any serious sports reader.